It's impossible not to have fun at Cirque du Soleil, where art and human talent come to the fore, and no animals come under the lash. 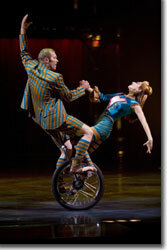 Like Fellini's The Clowns, Cirque's Koozå, the newest road show to reach here from the wizards of Montreal, uses classical fools as the central metaphor for this life, upon which an impressive and fresh array of specialists—acrobats; trapeze, trampoline, and high wire artists; contortionists; musicians; vocalists; scenic, lighting, costume, and sound designers—are woven into story. On opening night, we enter the big top after navigating a gauntlet of faux paparazzi, stilt walkers, and an assortment of bizarre beings, only to be at the mercy of clowns bearing flowers, balloons and popcorn. 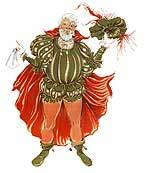 Once inside, the clowns establish three key themes: the first revolving around a boyish clown (The Innocent) trying to fly a kite, and his interface with a magician; the second involving a couple of Keystone Cops chasing a variety of "criminal types"; and the third involving a quixotic Clown Prince and his power trip. 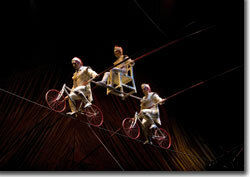 Together, these threads make Koozå Cirque's most cohesive show of the seven we've seen. The juggler will amaze as he rotates through ever more impossible numbers of hoops, balls, and pins, keeping them all in the air in ever more impossible patterns. The vaulters with stilts defy possibilities. The pickpocket who fleeces the unwitting audience member makes us wonder if this isn't a handy skill to study during an economic crisis. Apart from some ogling and some scatological humor by the clowns, Koozå maintains the artistic standards for which Cirque is renowned. 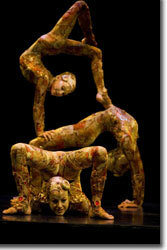 All in all, a splendid collection of astonishing acts artfully woven together as only Cirque du Soleil can do it. Koozå runs through October 4th under the big top in the Pepsi Center parking area. 1-800-678-5440.